CONCORD, N.H. - The New Hampshire Fish and Game Department's "Let's Go Fishing" program is in need of avid anglers looking to give back to their community and share the love of the great sport of fishing. The program is currently seeking volunteer instructors to teach ice fishing, fly fishing or basic fishing to youth and adults. You can get certified to be an instructor at training sessions coming up this fall at Fish and Game. A prerequisite for getting trained as a Let's Go Fishing instructor is completing both CPR and first aid certification training. A copy of your certification cards must be submitted with your application. If you do not have CPR and/or first aid training, classes are being offered for prospective instructors on Wednesday, September 28 (CPR), and Thursday, September 29 (first aid), at Fish and Game Headquarters, 11 Hazen Drive in Concord. The classes will run from 6:30 p.m. to 9:30 p.m. To sign up, fill out the Let's Go Fishing Instructor Application, available at www.fishnh.com/Fishing/lets_go_fishing.htm (or call 603-271-3212 or email aquatic-ed@wildlife.nh.gov), including the CPR/First Aid training class reservation part of the form, and mail it in. Your instructor application and reservation must be received by Friday, September 16, 2011, in order to reserve your spot in the CPR/first aid training. You may also attend a class in your local community. Once you have the required CPR and first aid certification, you can sign up for this fall's Let's Go Fishing training sessions. This free training is a requirement for becoming certified as a Let's Go Fishing instructor. To sign up, just print out and return a volunteer instructor application form, available at www.fishnh.com/Fishing/lets_go_fishing.htm, including the instructor training reservation portion. As mentioned above, copies of your CPR and first aid certification cards must be submitted along with your instructor application, unless you are attending the Let's Go Fishing-sponsored CPR/first aid class in September. Applications for instructor training must be received by Friday, October 7, 2011, to reserve your spot. Those being certified must attend both an overview training session and at least one specialty training class. The overview session will cover the ins and outs of the N.H. Fish and Game Department and the Let's Go Fishing program, as well teaching practices and principals. The specialty sessions focus on the specific programs presented -- ice fishing, fly fishing, or basic fishing; these are hands-on experiences where prospective instructors are put through an abbreviated "real life" Let's Go Fishing course. Topics covered include ethics, pond ecology, rules and regulations, equipment and safety. Instructors must attend the specialty training session for each course topic they wish to teach. The Let's Go Fishing program will hold the first half of the two-part certification training for new fishing instructors on Saturday, October 29, 2011, from 8:00 a.m. to 4:30 p.m., at Fish and Game Headquarters, 11 Hazen Drive in Concord. Lunch is provided. This class is required for all new instructors. All instructors also must attend the second half of the certification training for the specific type of course they will be teaching, as listed below. These training sessions take place from 8:00 a.m. to 4:30 p.m., at Fish and Game Headquarters, 11 Hazen Drive in Concord, N.H. Lunch is provided. After completing the training, participants have the chance to join an existing team of volunteer fishing instructors who present programs across the state. 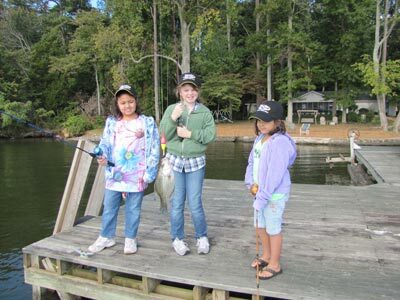 The Let's Go Fishing program also offers: saltwater fishing, fly tying and saltwater fly fishing. Sport Fish Restoration ProgramThousands of children and adults have learned to be safe, ethical and successful anglers through the Let's Go Fishing program. The program is federally funded through the Sport Fish Restoration Program, which is supported by your purchases of fishing equipment and motorboat fuels.